The U.S. Departments of Justice and Education have announced that they will investigate allegations that Yale University illegally uses race in its admissions decisions to discriminate against Asian American applicants. Yale now joins Harvard as under investigation by the Department of Justice. 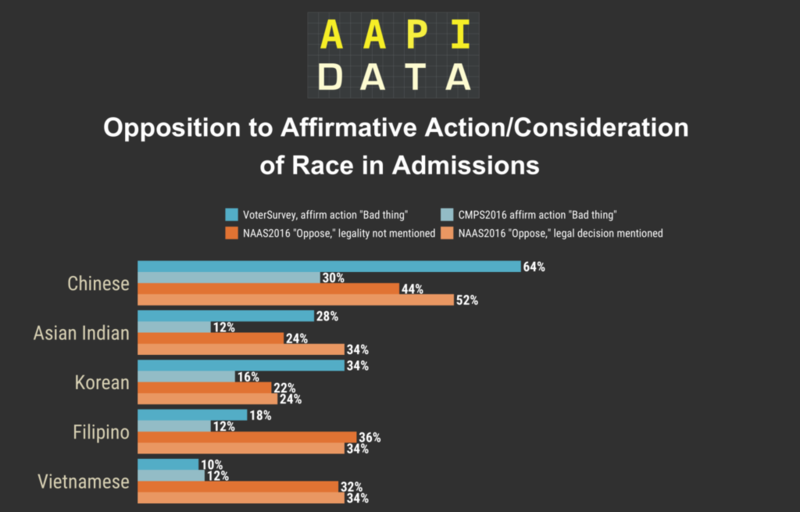 Asian Americans are the center of the debate about affirmative action, and while there has been much media attention to the allegations of racial discrimination against them, there has been little research on Asian Americans’ attitudes toward affirmative action. This is our effort to go beyond the splashy media headlines, and place the spotlight on Asian Americans by focusing on their opinions of affirmative action. A common misperception is that Asian Americans oppose the use of race or ethnicity in college admissions. The reality is more complex. 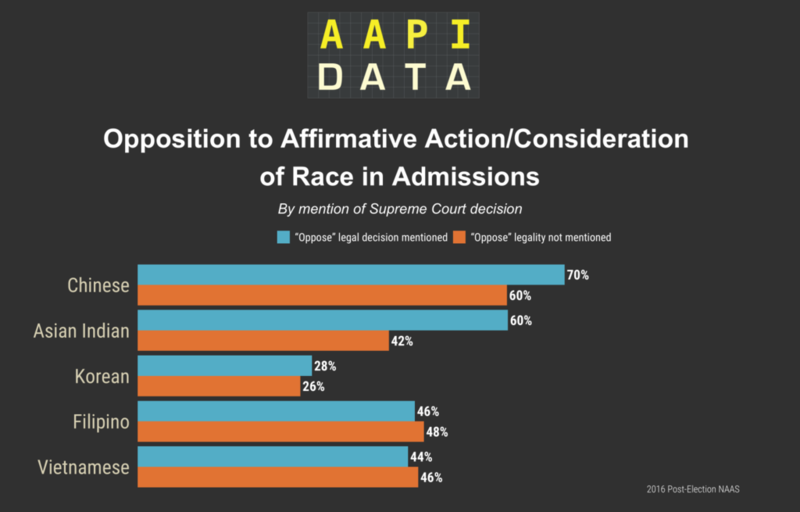 The tables below provide data from several surveys conducted in 2016, and show that in most cases, regardless of how the question is asked, Asian Americans are more likely to support than oppose affirmative action. However, rates of support among Asian Americans are influenced by the question framing and order/priming effects. Question Wording*Do you favor or oppose affirmative action programs designed to help blacks, women, and other minorities get better access to higher education? Question Wording*Do you think affirmative action programs designed to increase the number of black and minority students on college campuses are a good thing or a bad thing? Question Wording*Do you think affirmative action programs designed to increase the number of underrepresented minorities, such as African Americans and some Asian groups like Cambodian Americans, on college campuses are a good thing or a bad thing? Question Wording*Do you favor, oppose… allowing universities to increase the number of black and some Asian American students studying at their schools by considering race along with other factors when choosing students? Question Wording*The U.S. Supreme Court has ruled that it is legal for universities to consider race along with other factors in choosing students. Do you favor, oppose …allowing universities to increase the number of black and some Asian students studying at their schools by considering race along with other factors when choosing students? Framing matters. The surveys above, all conducted in 2016, allow us to look closely at framing. A first question, replicating a question from Pew, asks respondents about the extent to which they favor or oppose affirmative action programs designed to help blacks, women, and other minorities get better access to higher education. 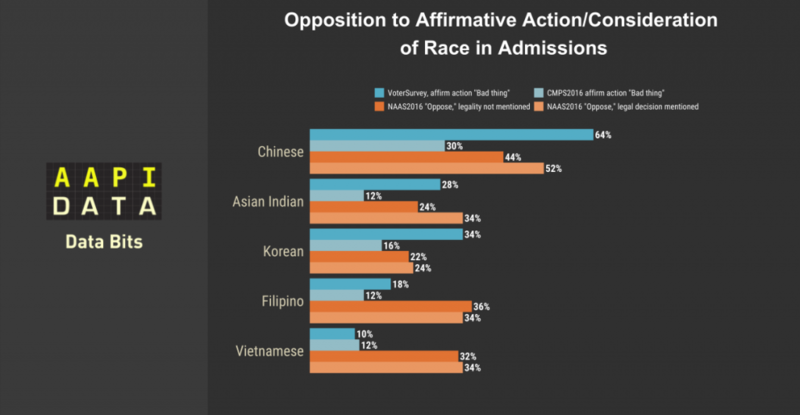 Like past studies, this question shows that a majority of Asian Americans support affirmative action. Support is lower, however, when “women” are not included as potential beneficiaries in the question. In the 2016 National Asian American Survey, we included two questions similar to a 2016 Gallup poll question. Half our sample received one, and half received the other. In both versions, the poll mentions “increasing numbers” and “considering race.” The only difference between the two questions is whether a decision by the Supreme Court making it legal for universities to consider race along with other factors in choosing students is mentioned. Here we see the lowest levels of support for the policy. Attitudes toward the Supreme Court’s role may account for variations in support, since the other elements of the policy frame are consistent. These survey-design effects also affect White, Black, and Latino Americans’ attitudes of affirmative action. Question Order and Priming matter. The lowest rates of support are from the 2016 National Asian American Survey. On that survey, questions about “consideration of race” as a factor in admissions came after a series of questions that could have serious priming effects. That is, the questions preceding the affirmative action questions may have primed stereotypes about Whites, Blacks, Latinos, and other Asian groups, triggered feelings of experiences with racial discrimination and unfair treatment, and made more salient beliefs that some groups receive preferences in jobs and promotions. “Don’t Know,” “No opinion” or “Neither Favored nor Opposed” The table above shows opinion among only those who expressed a pro- or con- viewpoint to facilitate comparison since the proportion of those who did not express a pro- or con- viewpoint varies a great deal between the Voter Survey and the NAAS. In both the CMPS and NAAS surveys, close to 1 out of 4 respondents did not choose a pro or con response to the policy question. This is partly a function of response categories – the Voter Survey included a “Don’t know” response, but, unlike the other surveys, did not include an explicit neutral option. Respondents in the Voter Survey were often half as likely as those in the NAAS to choose an option that was neither “pro” nor “con”. These patterns may also may indicate that more information about affirmative action policies could benefit Asian Americans. Research by Michelle Moses and Lauren Saenz shows that historical and substantive information is rare in media coverage of affirmative action. As such, misinformation about affirmative action is common among both supporters and opponents of the policy. For example, both supporters and opponents of affirmative action incorrectly assume that it is legal for colleges and universities to employ racial quotas to meet diversity goals (quotas were deemed unconstitutional by the Supreme Court in 1978). Many also believe that there is an Asian test-score penalty, such that Asian Americans must score 140 points higher than White students to be admitted to elite colleges, though this myth has been debunked. Finally, a recent lawsuit against Harvard university spearheaded by anti-voting rights activist Edward Blum was misleadingly framed in the media as being about admissions officers rating Asian American applicants poorly on their personality traits. It may be that those who have no opinion on the issue lack sufficient facts about the policy to make an informed decision of support or opposition, or that they are simply neutral on this issue. Focusing on the top five Asian ethnic groups, the data in the figures below show that Chinese are much more opposed to affirmative action than other Asian groups. This is the case across surveys and regardless of question framing or other potential influences on reported rates of support. Among other Asian groups, opposition to the policy is much more muted. Support for affirmative action among Asian Americans has remained stable since 2008 – With the exception of Chinese respondents, rates of support for the question asked in the first column (the only version of a question that has been asked consistently since 2008) have remained relatively stable. This suggests that underlying attitudes have remained consistent among most Asian Americans, and that question framing is one of the main drivers of the differences in levels of support we see across the surveys in the tables. Framing affirmative action as increasing “access” versus increasing the “number” affects support – When affirmative action is framed as increasing access to under-represented groups, it garners higher levels of support. When the policy is framed as increasing the number of under-represented groups, it draws higher levels of opposition, perhaps because it invokes the idea of quotas, which have been ruled unconstitutional since 1978. These differences further underscore the responsibility of researchers and policymakers in shaping this debate, both in the production and the application of research findings on affirmative action. We urge attention to framing in the discussion of these findings and look forward to conducting more in-depth research on the effects of framing in future surveys of the Asian American population, as well as the decline in support among Chinese Americans.